Daily Magic Games is quickly becoming one of my favorite publishers. I LOVE the Valeria series, with Valeria: Card Kingdoms replacing Machi Koro in my collection and Villages of Valeria (review here) becoming one of my family’s most played games. I also played (and enjoyed) Food Truck Champion as part of our Kickstarter Preview published in February. I immediately backed it and, assuming a timely delivery, it will be waiting under our Christmas tree for my daughter (shhhh… don’t tell her). 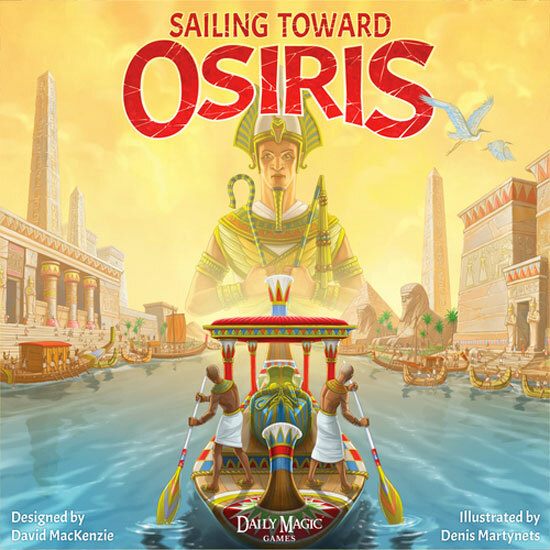 When I was presented the opportunity to do a Kickstarter Preview for Daily Magic Games’ Sailing Towards Osiris, I jumped on it…well, not literally, as it was a prototype and I didn’t want to damage it. But I was very excited to be given this preview! 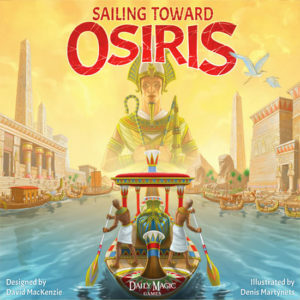 Sailing Towards Osiris is a game that simulates the building of monuments and tributes to win an election… sort of like in the United States, except in Egypt. The Pharaoh has died and he has no heirs. Governors (the players) have four rounds to build the greatest tribute to Osiris in honor of the recently deceased Pharaoh, with the wining governor becoming the Pharaoh’s successor. Player cards can either be used for their resources or their special power. At the start of each of the four rounds, players will draw laborers from a bag and hide them behind their screen. Laborers come in three flavors professions: farmer, brickmaker and stonecutter. In addition, each profession has one master laborer, which is more powerful than the basic laborer. Then all but a couple of the remaining laborers are placed on the board for hire. Harvest resources – Laborers are placed on the board and collect resources. 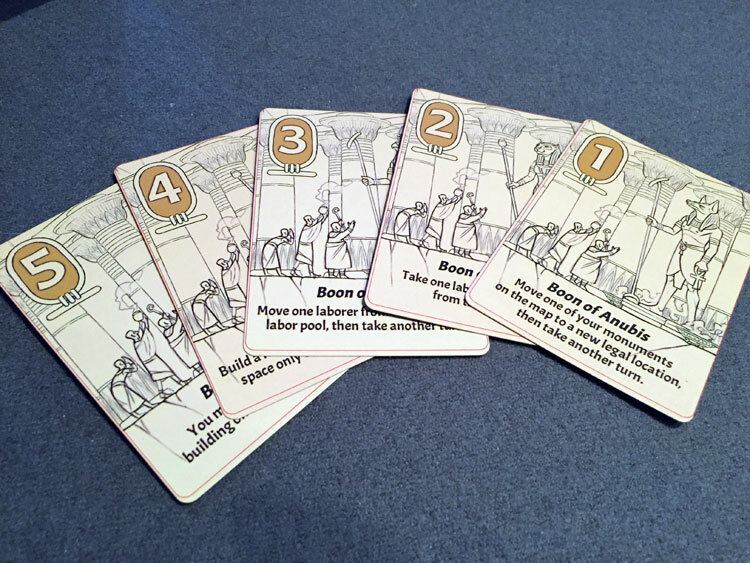 Visit a city – Place a laborer in a city and draw two city cards, with the player keeping one and giving the other to one of their governors (again, in a similarity to U.S. elections, bribes are encouraged). Start/join a caravan – Place a laborer in a caravan and collect resources – if you are the first governor there and another governor joins the caravan, they must pay one of the resources they collect to you. Hire an extra laborer – Pay resources to hire one of the available laborers on the board. Plan a monument – Place a monument on a plan that will, hopefully, be built later in the round. There are three monuments, with two of them having three different plans and one having two variations. A plan is made up of different combinations of the three main resources in the game. Build a monument – Pay the resources needed for the plan claimed as discussed above and place the monument on the board. If a planned monument is not built by the end of the round, it is removed from the game. Trade at the market – Players can make one of four available exchanges of resources. Once used, that exchange cannot be used again by ANY player that round. Play a city card – City cards have two resources in the top left corner and a power at the bottom. The card can be played for EITHER the resources or the power and is then discarded. Play a boon card – Each player starts the game with the same set of five boon cards, numbered one through five. Once per round a player can choose to play a boon card. That boon card cannot be played by any other player that round. At the end of each round, all played boon cards are removed from the game. Pass – A player can pass. Once a player passes, they are out for the remainder of the round. The first player to pass will get a bonus (the player will choose one of five available bonuses, which will be marked and no longer available for the rest of the game) and will become Regent (essentially the first player). 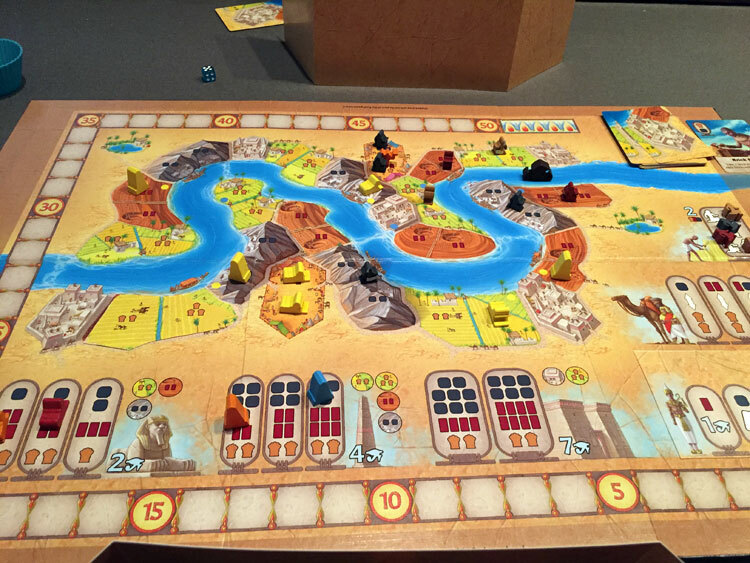 After every player passes, the Pharaoh’s barge moves one space forward, resources are returned to the supply and all laborers, used or unused, are returned to the bag and the game progresses to the next round. After four rounds, the Pharaoh’s barge reaches the Temple of Osiris and the game ends. During the game, glory points are awarded for building monuments as well as being the first governor to build ALL of one type of monument and building monuments adjacent to the river segment the barge is currently occupying. 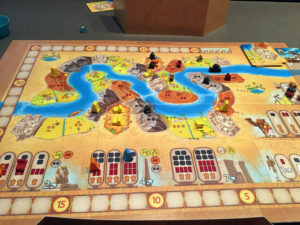 At the end of the game, players are awarded bonus glory points for building their monuments adjacent to each other and for building four monuments on the same river segment. The player with the most glory points wins and becomes the next Pharaoh. 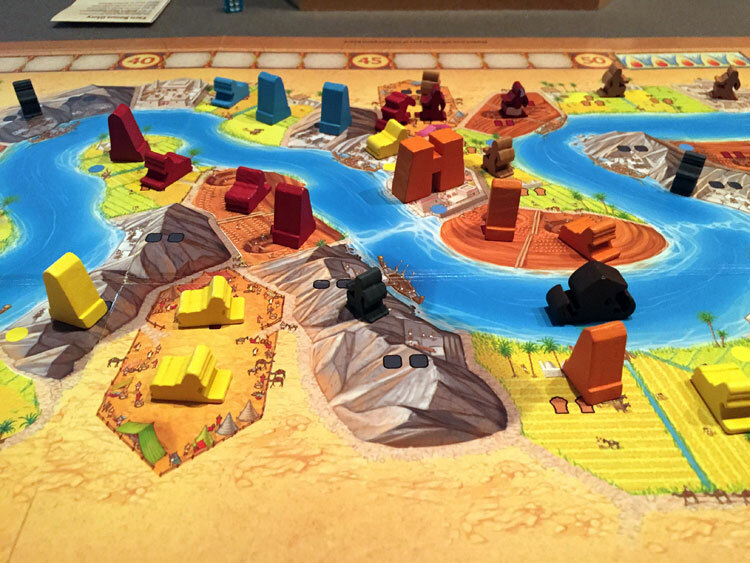 Players will be building monuments along the river, with a variety of scoring opportunities. Sailing Toward Osiris is not a run of the mill Euro. 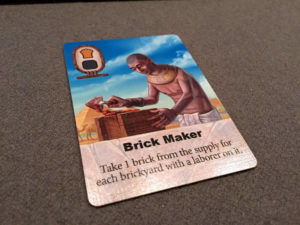 Yes, you place laborers to collect resources, convert those resources into monuments that you place on the board to score glory points; however, it has several individual mechanics that, when combined, make this game unique. I really liked the mechanic for the boon cards and the restrictions of them. For one, the design of the way spaces on the board are handled is great. Each space, except for city spaces, is divided into two sections. When a laborer is placed on a space, it can harvest BOTH sections. In addition, the laborer must be placed on a space that is adjacent to the river space the barge is currently in or that had previously been occupied by the barge. The only exception to this is the master laborer, which can be placed on ANY unoccupied space, be it in front of, adjacent to or behind the barge. As the game progresses and the barge moves down the river, more spaces become available for harvesting, so it must get easier to place your laborers, right? WRONG! When a monument is built, it is placed on one of the two halves of ANY unoccupied space. In addition, there is a bonus glory point awarded for building a monument on a space that is adjacent to barge’s current river space. The decision of should I place a laborer to collect resources vs. should I plan and build a monument is one of the most fun and difficult decisions that need to be made throughout the game. I also enjoyed the Boon cards. I LOVE the design decision that each player has the exact same set of cards and that, once a card is played (and you can only play one card each round), no other player can play that same card during that round. It adds another decision point of balancing when to play the boon card to best utilize its bonus versus waiting TOO long and an opponent playing the card you wanted to play, thus blocking you. Sailing Toward Osiris is much more than just a simple resource exchange game. Finally, depending on your groups gaming dynamics, the game encourages interacting in ways outside of just blocking/denying resources on the board. The city card mechanic (draw two, keep the one you want and give the other to an opponent) forces negotiation and bribing. But the game goes farther than that, and allows all players to haggle about ANYTHING at any point in the game, including after they have passed. Note: as player counts decrease, spaces are filled with unused player monuments to maintain the tight feel that is present in higher player counts. I enjoyed playing Sailing Toward Osiris. I love the limited spaces, limited resources, and trying to prioritize which actions to do first. Should I harvest? Should I play a boon card? Should I plan a monument? The game is “only” four rounds long, and provides a lot of decision-making in a game that is completed in less than 90 minutes. It is also a unique Euro that, with the right group of players, encourages more interaction than most of the other Euros on the market. I believe that Daily Magic Games has another hit on their hands! If you’d like to become a backer, Sailing to Osiris is now in funding on Kickstarter. Head over to their campaign page for more details.